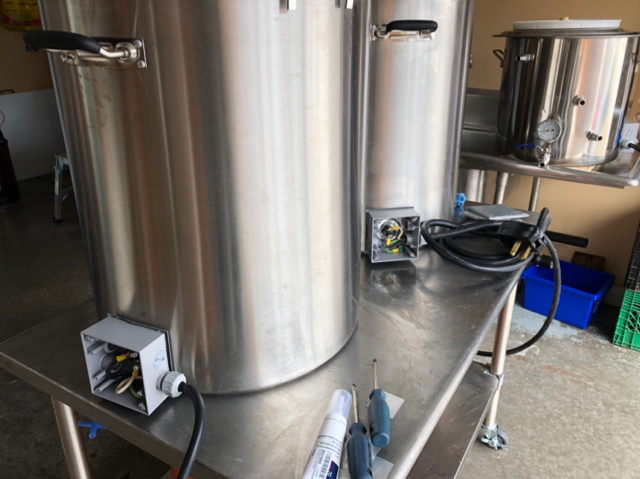 Did some proper wiring, having exposed wires stressed me out, lol..
Do you electric brewers use a GFCI spa panel for extra safety? I have a GFCI breaker in my sub panel i wired up just incase. I would perfer to have it just incase. I have a GFCI breaker I need to install. Water/wort seems to have a tendency to spray everywhere at inopportune times. I do have a GFCI spa panel. I also suggest using one. Indeed, I've been zapped by 30amps once before when working on a clothes dryer. I'd rather not take that chance again. Thanks all... Where would one find a GFCI sub panel or what's involved in building one? Cheapest option may be put the gfci breaker in your panel for the circut powering it. I got my spa panel from the US and put a plug on it and just unplug my dryer and plug it into that outlet. My panel uses Stab-Lok breakers.. Not having much any luck finding any 30 amp 2 pole ones that are GFCI. I found a few online but they are crazy expensive!?! Looks like I might have to build one... Where in the states did you find yours, Roger? Home depot. They are more than twice the price here in Canada though. I think I paid $60.00 on sale when I bought mine.